Sgurr Fhuaran is one of three Munros in a group of peaks on the N Glen Shiel ridge known as the "Five Sisters". The three Munros enclose Coire Domain to the E and to the W form the steep and rocky towering NE wall of Glen Shiel. 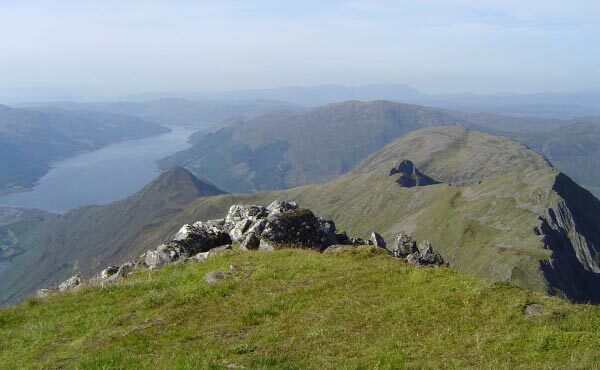 The main bulk of Sgurr Fhuaran lies to the E of the summit where its long and craggy E ridge and shorter and craggier NE ridge project into Gleann Lichd. To the WNW a long ridge with fairly steep and rocky slopes offers a descent route for those not intending to complete the Five Sisters. 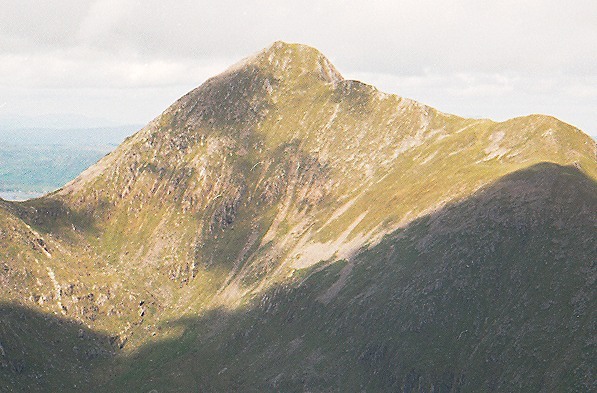 Sgurr Fhuaran is connected to Sgurr na Carnach by its short steep S ridge and to Sgurr nan Saighead (929m, but not a Munro) by its steep narrow N ridge. 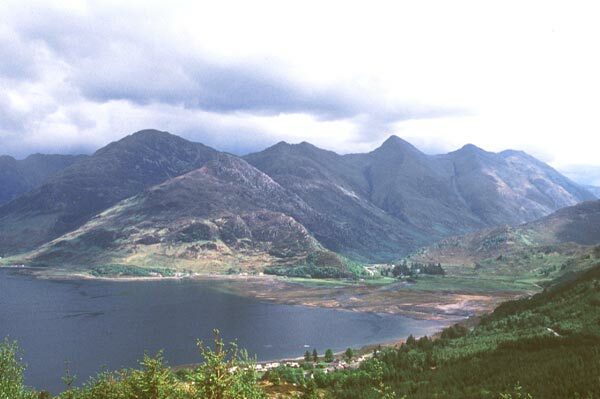 Sgurr nan Saighead (4th sister) with its lower north westerly top Beinn Bhuidhe on the right, Sgurr na Moraich (5th sister) beyond Beinn Bhuidhe on the right, the smaller bump of Sgurr an t-Searraich on the left with loch Duich on the far left. The 5th Sister - Sgurr na Moraich (back), Beinn Bhuide (middle) and Sgurr nan Saighead from Sgurr Fhuaran. The southern side of Sgurr Fhuaran seen across Coire Domhain from Sgurr nan Spainteach. The Five Sisters viewed from the road to Bealach Ratagain. Sgurr Fhuarar is the highest peak in the centre with Sgurr na Carnach behind it and the Sgurr na Ciste Dubh the most distant. 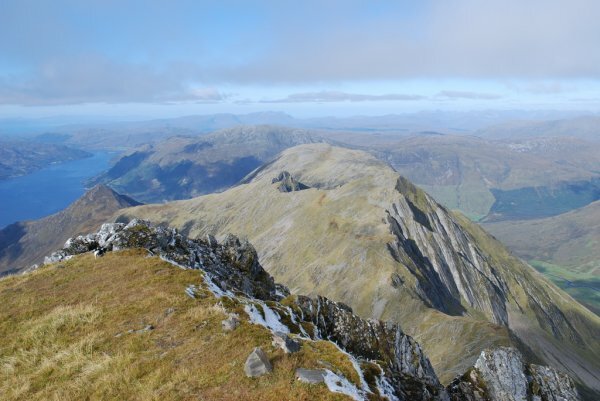 The summary information of one or more ascent routes that include Sgurr Fhuaran. 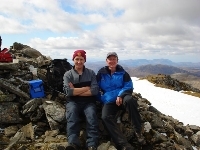 1 1809 m 20.24 km 7.5 hrs Sgurr Fhuaran, Sgurr na Ciste Duibhe and Sgurr na Carnach A moderate to strenuous route on the "Five Sisters of Kintail" involving some relatively easy scrambling. This is a classic route. Graham on Sgurr Fhuaran, 5th June 2009. Joanne at the top of the big sister, Sgurr Fhuaran, on 5th June 2009. Sgurr Fhuaran on 20th march 2009 absolute stunner of a day!! 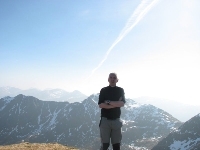 Post a few words about Sgurr Fhuaran or read what others have had to say. Absolutely loved every minute of this climb. Well, almost - the initial ascent was brutally steep and very long and since we descended directly from the 3rd munro, our knees have never been the same since. This was the most unpleasant descent I have ever had - steep, unrelenting and neverending. That said, the ridge walk was magnificent, extremelly enjoyable and the views stretched across an enormous portion of Scotland. Fantastic! We parked at Morvich and took the Land Rover track into Glen Licht and enjoyed the not so familiar views of The Five Sisters. This is a wonderful and under used route and Yvonne and myself highly recommend it. You will come to an old cottage which i believe is used by Mountain Rescue Crews which is your queue to turn right up an obvious well trodden path up steep ground to the bealach between Sailaig and Ciste Duibhe. Turn right and enjoy a great ride walk ! We completed Sgurr Fhuaran but a late start forced us straight down a "very" steep decent a few metres from its summit to the A87. STEEP !